In 2014, China was the largest producer of graphite with 780,000t, followed by India (170,000t), Brazil (80,000t), Canada, North Korea and Turkey with 30,000t, Russia (14,000t), Mexico (8,000t), Ukraine and Zimbabwe with 6,000t, Madagascar (5,000t), Sri Lanka (4,000t), Norway (2,000t) and other countries (1,000t). Kibaran’s primary focus is on the Epanko graphite project in south-east Tanzania which will be capable of producing 44,000 tons per annum (tpa) of flake graphite concentrate. Kibaran already has binding agreements for 30,000t of graphite per year including 20,000t with German company ThyssenKrupp and 10,000t with European graphite trader. “Kibaran is now studying the potential to increase Epanko’s production capacity based on forecast growth in lithium battery demand,” Spinks said. 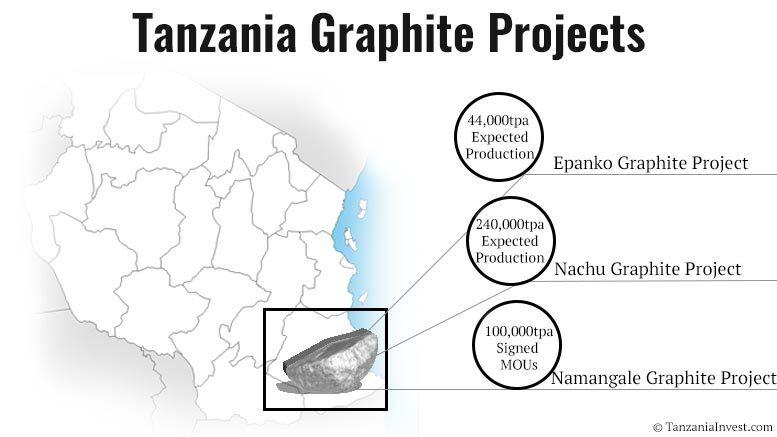 The Nachu graphite project in south-east Tanzania is 100% owned by Magnis and represents one of the largest mineral resources of large flake graphite in the world. The Nachu operating life is estimated at approximately 15 years. “This comprises approximately 11.7 years at 240,000 tpa nameplate concentrate output after which lower grade ore stockpiles are processed for another 3.5 years at an average concentrate output rate of 160,000 tpa,” as indicated in the Magnis website. According to the Magnis 2015 annual report, the company is focused on advancing the Nachu graphite project into production during the later stages of 2016. The Namangale graphite project in south-east Tanzania is wholly owned by Volt Resources. In Q2 2016, the company signed 3 Memorandums of Understanding (MoUs) with Chinese companies Optimum Nano, Huzhou Chuangya and Shenzhen Sinuo. The MoUs cover an annual production of 100,000t of graphite, of which 60,000t with Optimum Nano, 20,000t with Huzhou Chuangya and the remaining 20,000t with Shenzhen Sinuo. Australian mining company Volt Resources (ASX:VRC) recently announced that an independent German metallurgical laboratory has confirmed the high quality of the Namangale graphite concentrate. Australia-based mineral exploration company Walkabout Resources (ASX:WKT) recently announced that the high grade resource at its Lindi Graphite Project in southeastern Tanzania increased by 165%.